Features 4 buildable LEGO® DUPLO® vehicles: a fire truck, helicopter, taxi and a garbage truck. Includes a brick decorated as a traffic light and decorated bricks with different windows, drivers and passengers. 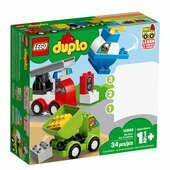 Create and connect with your young child and work on fine motor skills as you build iconic vehicles. Inspire little imaginations as they create all sorts of wonderful, colorful cars of their own! Encourage social and emotional skills as toddlers enjoy role-play fun with the decorated characters traveling in these cute toy cars for kids. 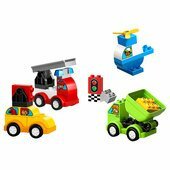 These toy cars and trucks for toddlers make an ideal gift for preschool children. Fire truck measures over 4” (11cm) high, 3” (9cm) long and 2” (6cm) wide. Helicopter measures over 3” (9cm) high, 3” (9cm) long and 2” (6cm) wide. Taxi measures over 2” (6cm) high, 3” (9cm) long and 2” (6cm) wide. Garbage truck measures over 2” (7cm) high, 3” (10cm) long and 2” (6cm) wide.